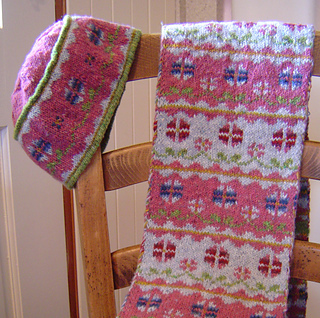 A thick, colourful scarf with matching hat in two colourways to remind you that spring is coming. 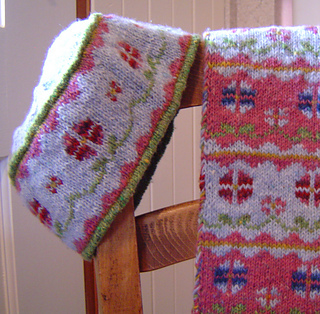 Constructed using the double knitting technique, it has a flowery ‘right’ side and a ‘wrong’ side of abstract shapes and stripes. 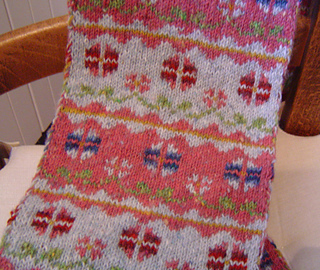 Rowan Fine Tweed is also called Rowan Fine Nordic Tweed. 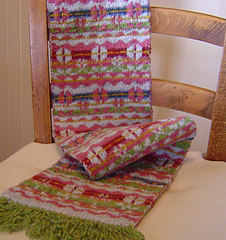 You will need 6 balls of to complete one hat OR 13 balls to complete one scarf, but only 14 balls to complete one scarf PLUS one hat. 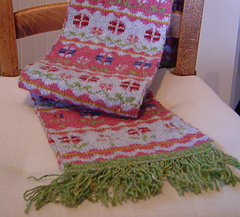 The finished scarf is 18.5 centimetres (7.25 inches) wide and 145 centimetres (57 inches) long, not including the fringes. 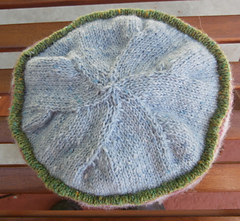 Each finished hat is 16 centimetres (6.25 inches) in diameter and 13 centimetres (5.125 inches) high.